Nikon whips out another DSLR, this time beating Sony at their own game. I thought sure Sony would be the first to come out with a movie mode on a DSLR, but it's not to be. 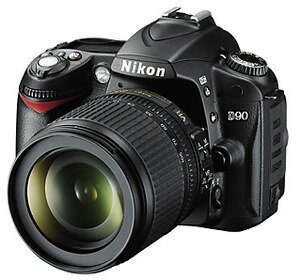 Check out the Nikon D90, an upgrade to the D80 and the newer D60 that was brought out just a couple of months ago. The biggest news is the movie mode, but more stuff is new too, look below. Sony has some good deals on the A700, $1099 for the body only or with the 18-200mm lens for $1299. Buy this kit and eBay the lens for $300, and get the body for a grand. Beware of dealers selling Sony DSLRs for less than retail, Sony has a unilateral pricing agreement with their legit resellers, which means they can't offer it for less than retail. Beware of NYC joints low-balling prices. Movie mode with sound, 1280-720 (720p) @24fps and lower, must use manual focus and zoom. Optional GPS unit, no price yet. Five Face advanced face detection. ISO 200-3200 with Lo1 and Hi1, 100-6400. Active D-lighting, distortion control with registered lenses, and image straightening. HDMI out for viewing on your HDTV. Burst rate of 4.5fps for (?) frames, JPEG. Possible CA correction, but not listed. Same old Li-ion battery, but a whopping 850 shots per charge. $999 or $1299 D90 and above lens. I've got some additional second phase reviews ready for service. A couple had to be completely redone, check out the list below. I should have all the Sony reviews redone by the end of the week. On the Coming up list I've added the Minolta 28mm F/2. I'm thinking that one should be out next month sometime, plus the exciting comparison reviews of the "kit" lenses from Canon, Nikon and Sony, all happening next month. I hope to have all that done before the release of the A900 or whatever the actual name is going to be. Once I get that baby in my hands I'll have to update all the full frame/film compatible lenses, and maybe even see how the DT lenses work on it too, we'll see, I might be getting ahead of myself. Well, I've been busy with the lens review updates, see the list below. I was wading through the camera lenses on eBay when I thought I saw a picture of a lens that looked familiar. I laughed at it because it was a typical eBay type shot, when it suddenly hit me that the dude jacked my photo!! So there I had an "epiphany" if you will, which will help me finish the "lens updates" and new Product shot photos in a rather quick manor. I guess it's no big deal, I've seen plenty that aren't as good as mine. Below is a list of the lenses that I've updated to date, I should have the others done by the end of the month or so. Most of the changes are related to observations and a few different photos better illustrating the optical performance. 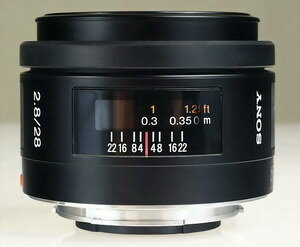 Ready for your scrutiny is the Sony 28mm F/2.8. It's the same basic lens as the Minolta AF 28mm reviewed here also. I've had the Sony copy quite a while and decided I'd wait to review it 'till I got my second phase lens review page all worked out and finalized. I hope you'll check it out and let me know if you like it better. I think it's better because it gets more information to you quicker using a more cohesive format with less clutter than before, and more lovely product photos. Also, no more test charts. I haven't used any for over a year now but I will continue to use my stamp for close focus shots etc, it just works great for that. I'll be using this review as a template for all others from now on, and I might try to convert some of my older lens reviews into this new page. I updated the Minolta AF 28mm F/2.8 too. Plus, I'm working my way through all the close focus shots for all lenses using the A700. These little el cheapo close-up lenses really work great, just don't stack three or you'll be wasting your time. I have a nice detailed review here. 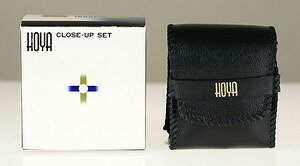 I used the Hoya 49mm set, which fits my Sony/Minolta 28mm F/2.8, and the Minolta 35-70mm F/4 lenses. I tested them on both but most of the review uses the 35-70mm which has a better macro to start with. Check out the nice close-up I took with the 28mm lens, not bad for a 0.13x reproduction ratio. Next up is the Sony 28mm F/2.8 review. I'm still plugging away at the new macro page, be patient.